The key top lines follow. In California: Democrat Barbara Boxer 48, Republican Carly Fiorina 44 (MoE 3.5) for Senate. Democrat Jerry Brown 46, Meg Whitman 48 for Governor. 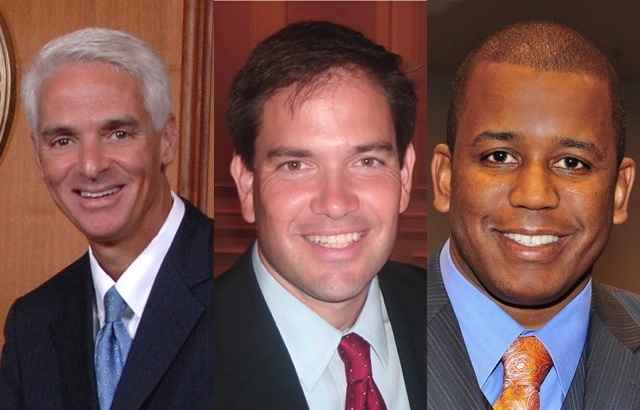 In Florida: Republican Marco Rubio 36, Independent Charlie Crist 34, Democrat Kendrick Meek 24 for Senate. Democrat Alex Sink 49, Republican Rick Scott 42 for Governor. In Kentucky: Democrat Jack Conway 46, Republican Randal Paul 46 for Senate. Particularly in Kentucky, these results don’t match up with those other polls have shown. It’s easy just to say “Oh, it’s a poll of registered voters, never mind” but it’s important to see why that matters, in case a time comes when it doesn’t matter. Well first off, I find it interesting that the poll itself seems to emphasize the party labels on each candidate. Most polls I see usually just list candidate names, but this one make sure that you know that each candidate is the nominee of his party, and makes sure you know what party that is. That could skew things. I also suspect these party ID figures are just way out of line… but OR doesn’t give those directly. So let’s see what we do have. Barbara Boxer is supposed to be getting 18% of conservatives. Yeah, and I have a bridge to sell you. For comparison, SurveyUSA has that figure at 8. But yes, as we all know, having been registered to vote for the 2008 election isn’t especially meaningful as a predictor of voting in 2010, not when Democrats are deeply depressed in 2010, Republicans were depressed in 2008, and on top of that midterm elections get lower turnout than Presidential elections every time.